Balarama Holness, a McGill law student and former Montreal Alouettes player, is helping to launch the petition for a public consultation in to systemic racism in Montreal. Photo by Miriam Lafontaine. To mark Nelson Mandela day, a petition has been launched by the Center for Research-Action on Race Relations to hold a public consultation on systemic racism and discrimination in Montreal. 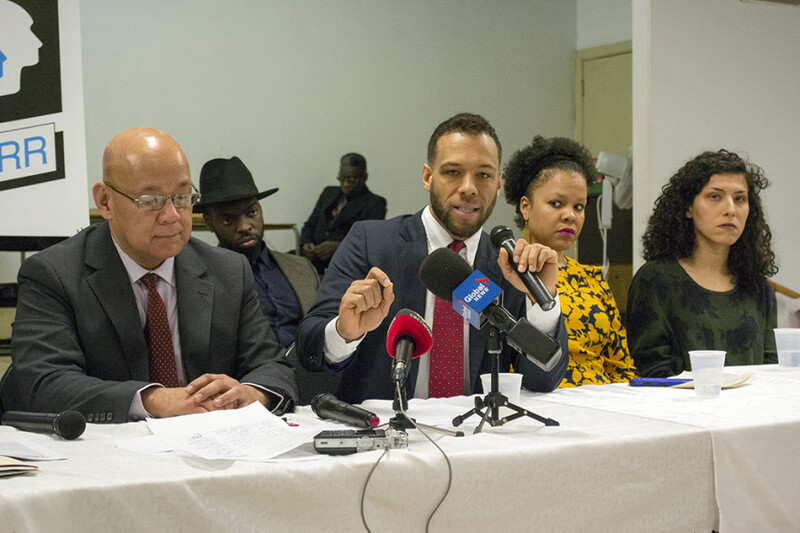 “Our institutions don’t reflect our charter,” said Balarama Holness, a McGill law student and former Montreal Alouettes player who helped launch the petition, during a press conference at the Union United Church on Sunday. Within 90 days, activists behind the petition hope to garder 15,000 signatures so the city will be obliged to run the consultation. Afterwards, they hope the city will launch an action plan to deal with systemic racial discrimination in Montreal. “That discrimination, that racism, is systemic. It happens at work, it happens at schools, it happens in public spaces.” – Abdel Blackett. Blackett cited a 2016 survey from Statistics Canada that showed visible minorities earn 81 per cent as much as non-visible minorities, and highlighted that in Quebec Black people hold a 13 per cent unemployment rate while unemployment for non-visible minorities stands at six per cent. “The gap is not closing over time, it’s widening,” said Blackett, who also sat on Quebec’s Human Rights and Youth Rights Commission for seven years. The consultation would address police brutality and racial profiling, the disproportionate criminalization of young men of colour, the lack of visible minorities in Montreal’s executive council and municipal services, rates of unemployment and poverty that are higher for visible minorities, rising Islamophobia, and the lack of minority representation within Montreal’s police force. CRARR Executive Director Fo Niemi also told The Link in a previous interview that pressure will be put on the Montreal police to begin another action plan on racial and social profiling. The Montreal police launched their own action plan between 2012 and 2014, but a report accessing the action plan a year later found it had been ineffective in addressing the issue. It showed officers don’t get enough sensitivity training, that there was also a serious lack of funding for programs meant to repair tensions between visible minorities and police officers, that the SPVM keeps no centralized database of the number of racial or social profiling complaints filed against them, and that visible minorities only made up seven per cent of the force. In light of Projet Montreal failing to elect any visible minorities, Snowdon city councillor Marvin Rotrand said at the press conference that the visible minority candidates Projet Montreal choose for Monreal felt “used” during the elections. “They felt they had not gotten the support they needed, that they were used as token candidates, and that they were not given a fair chance to be elected,” said Rotrand. Only four visible minorities are currently part Montreal’s city council, and Projet Montreal didn’t appoint any visible minorities to their executive committee. Ahmed Badr, external affairs and mobilization coordinator with the Concordia Student Union, also announced at the press conference that the CSU will be launching its own consultation into systemic racism at Concordia University this March. He launched it with arts and science councillor Aouatif Zebiri after hearing widespread complaints from students who spoke of having dealt with racist situations with their professors. Others complained that the school’s curriculum failed to address and represent the experiences and histories of people who aren’t white. They plan to use the results of that consultation to create an action plan.